So this is an old project I did last year for History day at school, for Violet(if you are wondering who Violet is read here..) She had to dress up as a historic character. Initially I had lots of people in mind that I could have dressed her up as, but I wanted her to learn something from the person she was dressing up as. As soon as this thought came to my mind, there was an instant choice.. Mother Teresa who is known for her kindness, compassion, selflessness, humility and love. Such an amazing woman! So, then I searched here and there..(just Pinterest actually 😉 ) of how can I make a costume. Mother Teresa always used to wear a white saree draped in a particular way and the challenge was that how will Violet wear a saree all day at school and use the toilet too 🙂 (even I struggle with wearing a saree!). 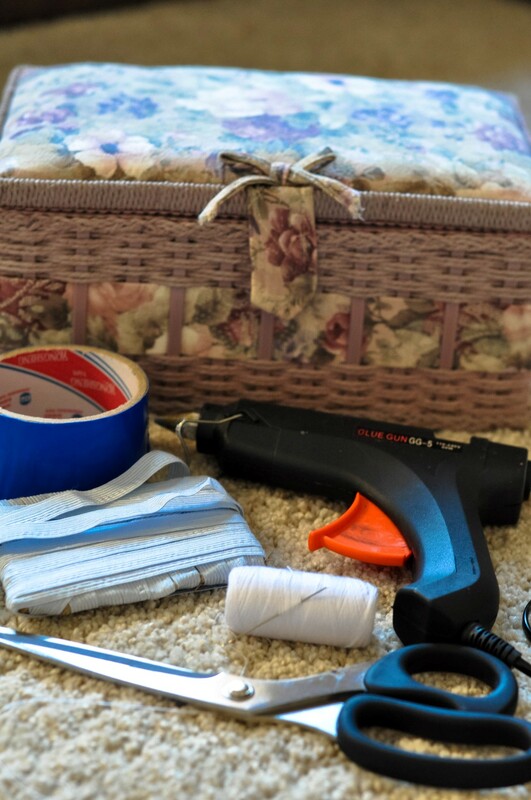 Another challenge was that I have no sewing machine (If you haven’t lived in an apartment in Doha with 3 kids, you have no idea how much storage issues you can have . I will do some organization posts for apartment living later), so I wanted something with minimal/no stitching at all. Here is what you need. I had an old white bed sheet that I used for the saree. Saree is a long single piece of fabric that is tied around, I decided to break that in two for Violet – a skirt and then an long stole that I draped and secured with safety pins. I basically cut the sheet in half and put the blue tape I found around both the rectangular cloths. For the skirt, I did a little stitching(by hand…yes my fingers hurt later!! ) and stitched the ends together and put an elastic in it for Violet to easily wear and remove it (specially for toilet breaks at school). For the upper part of the saree, I used hot glue to secure the saree on an old headband (this ensured that it stayed on her head all day without slipping- which btw it did perfectly). Then I cut up the cover of foil box in a cross and hot glued (Yes …Hot glue gun is my new best friend after my bestie ofocurse 😉 ) it on a clip. My little Mother Teresa.. ready for school. An OH EMM GEE Moment! Infertility Hurts – Don’t Make It Harder! Ahhhh very thought full DIY..very well done. its very nice to meet with you Sehar …. i really like your project. I see this was from a while ago, but it looks great! I was wondering what size of sheet you used. Twin? Thanks in advance and also for sharing. Thanks Becky! I am glad you find it useful! I used a twin sheet since my daughter is petite.. cutting it in half through the length was good for her height. Any tutorials on how to wrap it? The top soree, is that Judy one piece draped around somehow? Thank you!